October | 2014 | Edimentals ! On 19th August 2001, Stephen Barstow decided to attempt to break the world record for the greatest number of plant varieties in a salad in his garden in Malvik, Norway at 63.4deg N. However, from searches beforehand on the Internet, it didn’t seem that anyone had been daft enough to try this before. 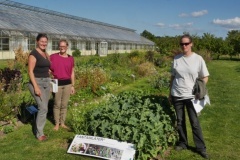 The salad was composed and put together in connection with the Norwegian National Open Organic Garden Day. The final salad had a grand total of 363 distinct plant varieties and 382 distinct plant parts (i.e., including flowers and leaves from the same variety). All bar two of the varieties were collected in the garden. Artikkel fra Ukeadressa i juni om spiselig Trøndelag!! ….and if you hover your mouse above the picture of all the ingredients in the linked picture you will see that all the plant names come up (common names in Norwegian, plus latin names) Enjoy!